I'm headed to gjilan, kosovo with a group of artists from my church this friday. we'll be working with high school art students there as well as holding workshops for the greater art community. I suppose I've sort of been sitting on this news for a while. wanting to write about it, unsure how or where to start. but now it's here and I'm all out of time. I am in full blown preparation mode and navigating batty pre-travel chaos. 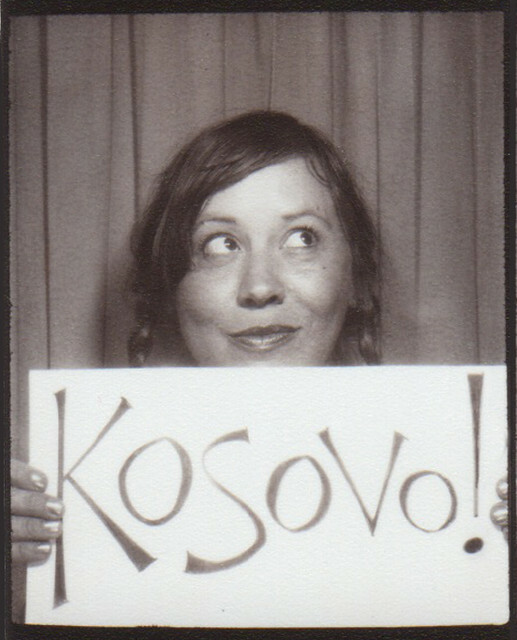 if I had the time, I'd tell you all about the country of kosovo. I'd tell you how newly independent and young they are, how 70 percent of the population is under the age of 30. I'd tell you how they're still recovering from a devastating war, how they struggle with a poor infrastructure and economy, a whopping unemployment rate of 40-50 percent. I'd also tell you how hopeful they are. the most hopeful of all the balkans, even in the face of serious struggle. I'm not going because I believe I can fix any of these problems. or because I believe I can fix anyone. I'm going because I believe art is a powerful way to connect with people. I believe it transcends language and a mess of barriers. I believe it gives voice to the voiceless. most importantly, I believe in how profoundly it reflects the image of God, the ultimate creator, thus connecting us to him in deep, meaningful ways. the truth is that I'm humbled by this whole thing. I'm going as a teacher but I'm pretty sure I'll come out on the other side the learner. And I'll be right here supporting you 100%, babe. I'm so proud of you! We'll miss you, but know that you'll be doing some wonderful work. Can't wait to see what transpires. Love love, me. i know you'll have an amazing time, and i know you'll have beautiful stories to tell us with words & pictures when you come home. travel safe and carry my blessings with you. Wow! Such an amazing opportunity for you. Have so much fun and take a million pictures! Can't wait to hear all about it!! Happy travels, Andrea! What a fabulous task you're taking on - I hope you enjoy every minute of it. safe travels - what an amazing adventure. Can't wait to hear/see what transpires! Wow, good for you, that will be awesome! holy moly, lady. you are going to touch so many people in this journey. and i know, because you have such an open heart, that you are going to be touched by all of the goodness in the people you meet. win-win. all the way around. for us, too, as we get to see it through your magical soul (and camera lens). How cool! It's going to be an amazing experience. this makes me so happy. I know you will have the best time and that God will use you so incredibly powerfully. I love that our church does this. I love that we have people in our church that step out to do this. But mostly I love that God is a God who cares so deeply about his creation and calls us to use our gifts and passions to peel back little corners of the darkness. Prayers are coming your way! Wonderful! Sounds like an amazing adventure. Safe and happy travels to you! So, um, we go to church together! And I've been praying for this team all week and will continue to do so through the duration of your trip. Can't wait to see your pics and hear about your experience. make sure you feel every moment, taste each new thing, see exactly what's around and smell every single odor..
Great stuff, I want to be like you when I grow up. I pray you have un please keep us updated about how we can pray for your trip. Have a blast lady! What a great opportunity for you and the students you will teach. what an amazing opportunity! safe travels and enjoy!! You have been SO gifted, Andrea! All that talent and love exudes from your very fingertips. Showing God's love through your creativity will be powerful for those students. Blessings and safety for this amazing opportunity. LOVE LOVE LOVE YOU! Amazing!! Can't wait to hear of your adventures. Hurray! This is so wonderful Andrea! I bet it will be an incredible experience and I think it's awesome that you're doing this. can't wait to see you back here with all your stories and photos. Have a great trip. I'll be following any updates and look forward to hearing about it all on your return. I've read and followed your work for a couple of years and rarely comment...want to wish you a safe and enlightened journey. thanks so much, everyone! for the kind, encouraging words, for the prayers... can't tell you how much it all means to me. thank you times one hundred. and alicia! we both go to mosaic? how awesome is that. which service do you attend? email me! we should meet! also, thanks for the prayers! andrea, how fantastic — have a wonderful time! What a fantastic opportunity - happy travels and experience. You and your blog make me smile. I am very late to the party...internet vacations get you behind on Google reader! LOL! It is amazing that you are going both as a teacher and an artist. Art brings creativity and more importantly - hope. It has brought me through so many things myself. Best wishes in your journey, you WILL come back changed. I know that firsthand...I went on a missions trip at 17....I learned flexibility in schedules, to always bring a jacket to services, and most importantly the language may be different but your actions are what will translate!! I am a high school art teacher, have been for four years. But I can't shake this feeling that I want to do something like this....travel and make art with students from around the world. People keep telling me I should have done this in college, but I wouldn't have appreciated it then like I would now. beautiful! i'm so thankful you use your talents to honor him, you are an amazing blessing!